The new Viking 68 Convertible not only lands granders, it does so in grand style. The new Viking 68 Convertible drew public acclaim in late January. Fresh from the New Jersey factory, the company’s demo model took first place at the 55th Annual Buccaneer Sailfish Cup Tournament out of Palm Beach with 25 releases. A week later at Viking’s VIP Boat Show Preview in the company’s Riviera Beach, Florida, facility, invitees swarmed over this exciting new model before the general public got a look at her mid-February during the Miami Yacht Show. Viking never has a problem attracting attention with its new models. This 68 is everything you would expect from the family-owned and operated company. 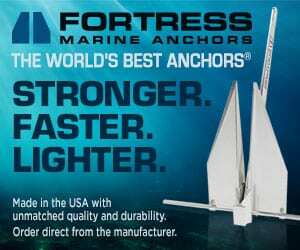 Because their mantra is about building a better boat every day—as they have for the past 54 years. Designed as a tournament winning contender, its fishing prowess is obvious the minute you step aboard. The bi-level, self-bailing cockpit is 176 square feet and includes an air-conditioned observation mezzanine with an extended flying bridge overhang. This provides shade and comfort below and is aptly suited for tropical fishing hot spots like Mexico, Costa Rica and beyond. Mezzanine appointments include standard amenities like bait freezer capacity, tackle stowage, a refrigerated drink box built into the salon step, and access to the walk-in engine room. The lower pit is equipped with a walk-through transom door and a transom fish box that can double as a livewell to complement recessed wells. If you prefer a topside livewell set-up, the corner scuppers can be set up with threaded drain fittings to minimize water on the deck. Rounded coamings provide comfort when working the fish to the boat for a fast release. Efficient use of available space includes side lockers under the coaming to stow gaffs and tag sticks. It also conceals the Glendinning cablemaster shore power cords, as well as DC outlets to power deep, drop equipment and kite and teaser reels. 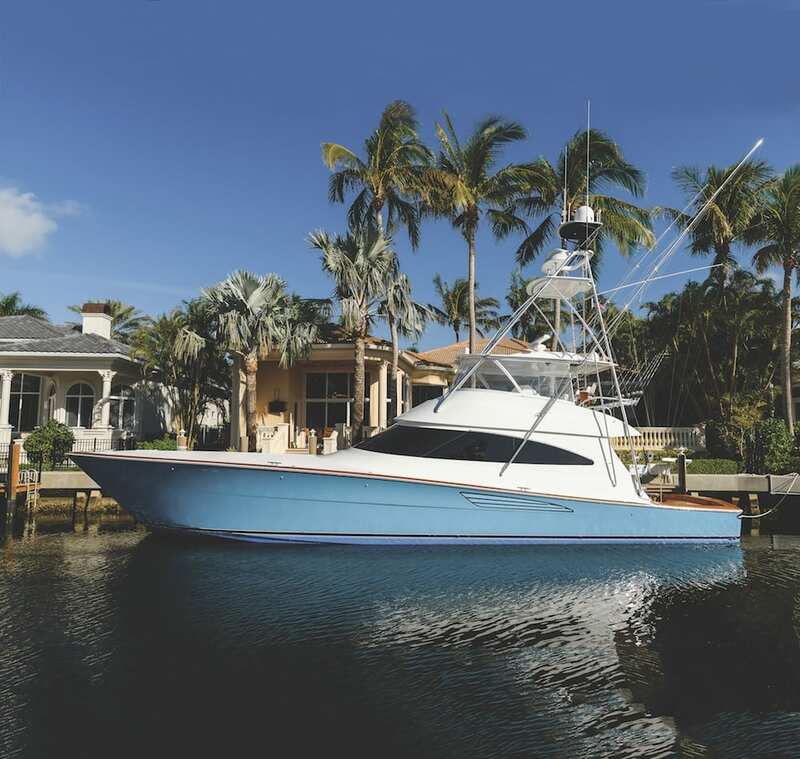 Viking is known for customizing each boat to the owner’s needs. The company’s demo program allows it to wring out systems and equipment best suited to the vessel’s intent. Our test boat, for example, featured a dedicated ice discharge receptacle in the mezzanine and a Seakeeper SK 26 gyrostabilizer in the lazarette. A fiberglass, electric sliding door leads to the salon. While the cockpit is all about fishing, the yacht’s interior is elegant and plush. Viking’s partner, WBC Design, created an exquisite environment of beauty and detail that is accentuated by Viking’s walnut joinery throughout. A dayhead is to starboard immediately inside the door. To port, an L-shaped Dewberry sofa with stowage below and a hi-low cocktail table address the home theater on the starboard side, a 49-inch HD TV that rises from the walnut cabinetry. Forward on the port side is a four-seat walnut dinette on a raised platform, which conceals a sizeable drawer that slides out to accommodate fishing rods and other gear. The bulkhead forward of the dinette is a perfect spot for another HD TV that can also serve as a monitor to show the yacht’s electronic displays from the flying bridge. The galley boasts Viking’s popular island arrangement which allows 360-degree access and makes it easy for two or three people to use without creating a logjam. The bi-level Cambria counters complement the three bar stools and the Amtico flooring. 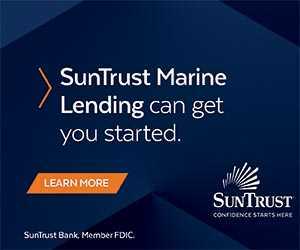 Sub-Zero under-counter drawer-style refrigerators and freezers with their large capacity are ideal for feeding guests while long-range cruising or making tracks on the tournament trail. A microwave/convection oven, a trash compactor, a garbage disposal in the stainless-steel, under-mounted sink, a four-burner electric cooktop, and plenty of stowage for supplies, cookware and utensils are all standard fare. Throughout the salon and galley, air conditioning flows quietly from walnut grills above the valances and window-framed lambrequins. Just forward of the galley cabinetry and adjacent to the companionway staircase, a walk-in pantry serves duty for stowage and electric accessories. One thing missing in the salon is a step up to the galley level often seen on large convertibles to create more headroom in a stateroom below. That’s another subtle distinction about the way Viking designs its boats. Viking’s in-house design group and its demo crews use their boats vigorously. Constant tournament fishing and the travel those require between events allow the teams to fine-tune each model bow to stern. That includes items like headroom, so every onboard feature works and works well. The crew stateroom, for instance, with six-foot, four-inch headroom also offers secondary access through the engine room so the crew can tackle early chores without disturbing late sleeping guests. Upper and lower berths with innerspring mattresses, plenty of stowage, entertainment systems, and a nice size head with a fiberglass shower stall ensure that crew also travel first class. The master stateroom is a royal suite with plush carpeting, a queen-size walkaround bed with an upholstered headboard, end tables with reading lights, a 32-inch HD television, and a total of 18 drawers, lockers and other stowage compartments, not counting the bulk space beneath the bed. You could travel for a month and not wear the same outfit twice. Even so, there is a front-loading laundry center in the companionway as well as a deep linen closet and other stowage lockers. The master head features a Cambria countertop, a curved walnut vanity, a fiberglass shower stall with a seat and a custom one-piece door, Amtico flooring, an MSD system, and more stowage lockers. The forward stateroom is similarly outfitted with a queen-size bed and a private head and shower, while the port-side stateroom features upper and lower berths and private head facilities. Viking’s reputation for its engine rooms displays similar 110-percent efficacy. Walking between the MTU 12V Series 2000 M96L engines supplied by Johnson & Towers is Disneyland for adults. Centerline headroom is six feet, six inches, and I had no problem walking outboard to reach batteries, the Spot Zero water system, the Aqua Matic desalinator, multiple Dometic air-conditioning units or other accessories. Our test boat had a second 29kW Onan genset (one is standard) with toolboxes atop each one. Forward on the port side is a dedicated room with the water heater, the MSD pump, condensate drains for the air-conditioning system and the Octoplex electrical distribution panel. Lifting a hatch exposes the central sea-water system that delivers ample flow to the livewells, wash down, ice chipper, air conditioning, and other critical water dependent units. The engineering is a textbook for proper installation with neat wiring, labeling, support, and chafe protection. Taking the helm for a sea trial in the ocean off Atlantic City, the GPS blinked 42 knots a couple of times, but the top end remained at 40 to 41 throughout maneuvers. The sea had gentle swells, and the running surface displayed the due diligence Viking’s engineering group put into developing an effective strake pattern for the bottom. At speed, the water breaks away from the hull just forward of where the house begins and the strakes do a good job of throttling the spray. It took a half hour of turning and cutting across the wakes before I could get so much as a few drops on the foredeck. Looking astern gives more clues to the bottom’s geometry: a very clean wake and minimal rooster tail. Even backing down was revealing, as the transom crown pushes water to the sides instead of digging in. 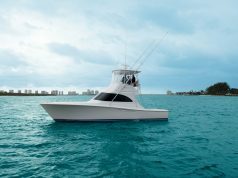 The Viking 68 also utilizes the company’s proprietary VIPER steering with programmable independent rudders, which gives the boat amazing maneuverability matched to the swift throttle response from the quiet and clean-running MTU engines. 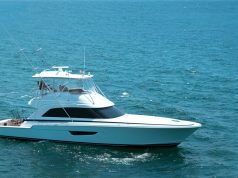 The flybridge is familiar to other large Viking stablemates with three Release Marine helm seats and a center console command station for good visibility over the long foredeck and cockpit. There is lounge seating with rod stowage underneath to port and starboard as well as a lounge forward. A big freezer, a refrigerated drink box, a sink, and freshwater outlet are among standard items. 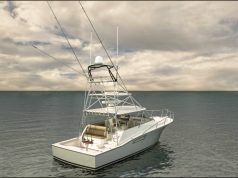 Our test boat also had an extensive navigation, communication and entertainment package installed by Atlantic Marine Electronics ($244,009), and a custom tuna tower/fishing ensemble from Palm Beach Towers ($180,786), both Viking subsidiaries, that allow the yacht to be delivered ready to fish and cruise, sometimes with special touches. The PBT tower, for example, features aft contour legs that attach to the house to provide more walking space on the side decks and larger drop-down boxes for teaser reels and electronics in the hardtop overhead. This boat also had the new Furuno DFF3D multi-beam side-scanning sonar for deep water scouting and its new DRS25AX 3-D radar with a gearbox design and a high-powered magnetron for spotting birds feeding on surface baits. To be sure, this new Viking is a hot ticket ready to fish, and the fish better watch out.